Just a quick post to prove to you that I do practice what I preach even when social convention challenges me to have second thoughts. This weekend we took a trip interstate to be involved in a birthday surprise for my husband’s mother who will turn seventy later this month. The main object of this surprise was for all her four children to be there with her in one place at one time for the first time in seven years. As she made a point of mentioning during the celebration, this may well be the last time it happens because it isn’t easy to orchestrate with all four children living in different states/territories with the complication of two being in the military. Tempting as it was to come up with a nice gift to commemorate the occasion, regardless of the fact that there really isn’t anything she needs, I decided to be practical. To be honest spending almost $1000 for three airfares, a hire car and accommodation was more than enough of a gift but I came up with a good alternative to arriving empty handed. She has sent me the odd comment on my blog about decluttering my craft items without consulting her first. 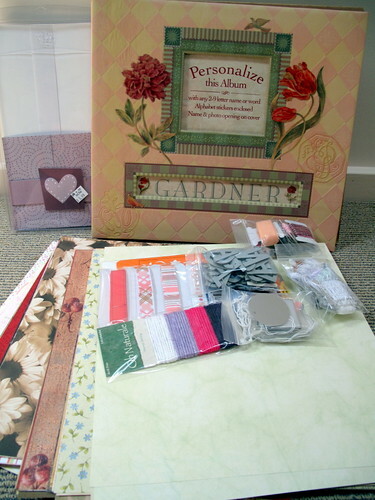 So in the spirit of that and in keeping with what I do and say here at 365 Less Things I put together a collection of paper crafting supplies – paper, album, embellishments and magazines and gave it to her as my gift. She was very pleased with my selection while I was very happy to lessen the mileage on my craft supply guilt trip. The collection of items given to my mother-in-law minus the magazines that were decluttered in a previous post and were sitting in the garage waiting to be sent to the thrift store. Decluttering – when I visit homes that feel to me to be full of clutter and return to my own mostly decluttered home it is like a breath of fresh air. Families that get along – sometimes we take this for granted but after a happy week-end with family – cousins, sisters, brothers, parents and in-laws – all getting along happily together I feel quite grateful to have been and continue to be a part of it. Rain – even though it can put a damper on outdoor activities, it just freshens up the city and makes it feel clean again. It we seem to get just enough of it here to keep my garden alive without having to water it myself. Good quality toilet paper – can’t you encounter some really poor quality toilet tissue in public restrooms. Also it is easy to tell that no thought what-so-ever goes into where most TP dispensers are mounted on the wall in these restrooms. The opportunity to help – the joy of helping others is arguably more satisfying then the relief of being helped yourself. Colleen, what a beautiful and thoughtful gift. And how practical for both of you since you want to declutter and your mother-in-law wants to scrapbook. I have been trying to bless others with some of my nice things that I am decluttering and it does give me a sense of joy and satisfaction in doing both at the same time. From your grateful list, it sounds like the family gathering was a good time for all. I was rather pleased with that gift idea and yes, the family gathering was very nice. I particularly enjoyed sitting back and watching the cousins all get along so well. They have spent so much time apart over the years as they are spread out all over Australia but when they get together they get on well. People say that the internet has ruined social behaviour but in a situation like ours these kids get to keep in touch whenever they like and feel like they are never apart. What a great idea, Colleen! I’m glad too that your mother in law liked the gift. And that reminds me to gift my handspun yarn to people who would appreciate it! I so agree on the uncomfortable feeling when I’m in a home crowded with things. Makes me ‘itchy’ and ‘unbalanced’. itchy and unbalanced that does sound uncomfortable. I am glad you liked my gift idea. I will give up a lot of things before a give up buying good quality toilet paper, that’s for sure. That was a great post on all points, and it sounds like it was a wonderful visit. I always try to give my daughter in law a chance to go through the good things I’m getting rid of before they go to charity, but she’s reaching saturation point. It’s nice that you have something specific that someone in your family would enjoy. And don’t get me started on toilet paper…oh yeah, it’s gotta be the good stuff! It was a wonderful visit and a great surprise for her to see all her children together. As for toilet paper it is a sensitive issue in more ways than one. Count me in with those who like your gratitude lists. I’ve been doing my own personal lists, mentally, but reading your lists reminds me of so many other things to be happy about. The ones about vision and families especially stick with me. I imagine that once all the visitors have left my mother-in-law’s house she will be having fun rummaging through the 100 or more sheets of paper to see what is among it. Some days I really have to zone out from everything else and just go over every little thing that transpired in a day to focus on not just the events but life’s little gifts that make those events and moments possible. Flowers aren’t just beautiful for their appearance or scent they are also beautiful for the texture of their petals and their roll in the lives of other creatures like the birds and bees. When you delve deeper you find all these little miracles to be grateful for. I really enjoyed taking the photos of the flowers last week but the thing I will remember from it the most was the lovely lady who was so kind and she was happy to have a little company for a while. Great idea Colleen! I wish I could do something like that for my mother-in-law, but she likes shiny, new stuff, from shops, sigh. PS I LOVED your question on the Unclutterer forum about whether you could justify your last purchase (I’m Lazycow on the forums). unfortunately many people like the “shiny, new stuff” but that is their choice. Luckily for me my mother-in-law doesn’t mind if the shiny new stuff comes from a shop or my house so long as it involves craft. My question at unclutterer has certainly provoked a few responses already. I am going over the Unclutterer now to see what you wrote Lazycow. Yes, that black summer top does sound like a reasonable purchase and you are going to need it very soon. Let’s hope you get a milder summer this year in Victoria. People still seem to think that you have to buy books rather than borrow from the library though. we love you and hope you have another nice day on the 13th. I had better get up to the craft room and make you a card.